The horoscope, or birthchart, is a symbolic representation of a specific moment in time for a specific place on Earth. It depicts the position of the planets as they would be seen from the place of birth, in relation to the background of the constellations. A chart is drawn up for this unique occurrence, and from this the Astrological delineation is made. In Astrological interpretation, the signs correspond to essential modes of being, to how particular energies tend to manifest. In order to facilitate this analysis, the characteristics of the signs can be classified into four elements - fire earth air and water and into three qualities - cardinal fixed and mutable. The elements describe basic patterns of temperament and disposition and the qualities describe the manner in which they are expressed. The fire signs - Aries Leo and Sagittarius - exude enthusiasm, warmth and energy; the earth signs - Taurus Virgo and Capricorn - tend to practicality, diligence and application; the air signs - Gemini Libra and Aquarius - are concerned with thought, communication and objectivity; the water signs - Cancer Scorpio and Pisces - relate to feelings, intuition and imagination. The cardinal signs - Aries Cancer Libra and Capricorn - are active and as such operate in a dynamic and enterprising way. The fixed signs - Taurus Leo Scorpio and Aquarius - are stabilising and as such operate in a concentrated and determined manner. The mutable signs - Gemini Virgo Sagittarius and Pisces - are adaptive and as such operate in a flexible and resilient fashion. Putting these key words together, it can be seen that Aries is actively enthusiastic, Taurus is determinedly practical, Gemini is adaptive in thinking, and so on. Each planet represents a key principle, and therefore corresponds to what particular energy is being manifested. The Sun through to Mars are called the personal planets. The Sun (not astronomically a planet, but for ease called so in Astrology) represents the individuality. It is the core of the person's self-expression, willpower and purpose whilst the Moon is concerned with the emotions, habits and basic needs. Mercury symbolises the intellect and mental processes, Venus love, values and beauty, and Mars assertion, drive and motivation. Jupiter is the planet of expansion and wisdom and Saturn of structure and consolidation. The three outer planets exert a more generalised influence and in turn stand for the principles of originality, ideals and regeneration. These pure planetary forces are modified somewhat by their zodiacal placement and so for example Mars in Sagittarius gives rise to a strong urge for adventure and exploration, whilst placed in Capricorn, the energy of Mars is directed towards the methodical achievement of ambition. The chart is divided into twelve sections, called houses. Each house represents a different area of life experience and as such corresponds to where the energies are being manifested. The start of each house is known as the cusp and in particular, those of the first, fourth, seventh and tenth houses are very important points and known respectively as the Ascendant, IC, Descendant and Midheaven. Collectively, these four points are known as the angles of the chart. The way in which the planets link with each other is another important consideration. The angular distances between the planets are called aspects. Since ancient times, it has been found that certain aspects are soft and harmonising whilst others call for effort and thus offer opportunities for growth. The import of the conjunction does tend to depend on the planets involved, sometimes easy and sometimes testing. The aspects that incline towards ease are represented by the trine, sextile, and semisextile. While the aspects that have a propensity to be challenging are represented by the opposition, square, semisquare, sesquiquadrate and quincunx. The chart is set out so that the houses are clearly marked and the degree and sign of each house cusp can be easily discerned. The planets are placed in the respective houses according to the degree and minute of the sign in which they fall. Links between the planets are shown within the central circle - red lines for the challenging aspects and blue lines for the flowing aspects. The Sun falls 16 degrees 35 minutes into the sign of Cancer in the 11th house. The Moon falls 0 degrees 42 minutes into the sign of Scorpio in the 3rd house. 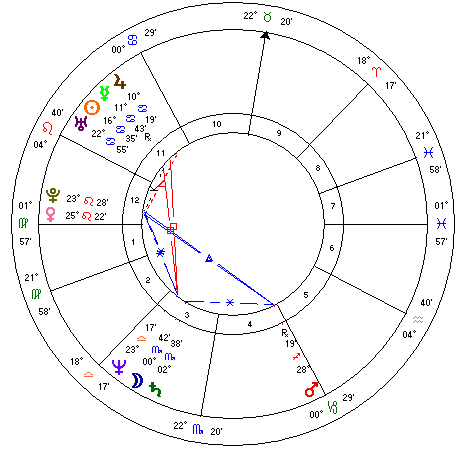 Mercury falls 11 degrees 43 minutes into the sign of Cancer in the 11th house. Venus falls 25 degrees 22 minutes into the sign of Leo in the 12th house. Mars falls 28 degrees 19 minutes into the sign of Sagittarius in the 4th house. Jupiter falls 10 degrees 19 minutes into the sign of Cancer in the 11th house. Saturn falls 2 degrees 38 minutes into the sign of Scorpio in the 3rd house. Uranus falls 22 degrees 55 minutes into the sign of Cancer in the 11th house. Neptune falls 23 degrees 17 minutes into the sign of Libra in the 3rd house. Pluto falls 23 degrees 28 minutes into the sign of Leo in the 12th house. There are many other points used in a full analysis of a birthchart, such as the Nodes, asteroids, fixed stars and parts. However, the most important factors are always the signs, planets, houses and aspects and their unique and particular blending and interaction within each specific chart. No one belongs exclusively to one sign, planet or element, for in each chart every sign, planet, house and element is present. The infinite differences in character and life arise from the individual combination of the particular influences shown. Through studying these configurations, a distinctive and unique picture is built up - certain emphases will be strong whilst others will fall more into the background of the delineation. In fact it has been estimated that due to the infinite possibilities and complexities of both time and place, no two charts will be exactly the same in a period of approximately two million years.